Nathalie and her team provide comprehensive, interesting and fun French language classes for all levels. The teachers all strive to provide a supportive learning environment, encouraging learners to progress at their own rate. Each term, a diverse lesson plan is executed, including trips to local restaurants, theatre and other exhibitions. The classroom is clean, comfortable and well equipped. I would highly recommend Nathalie and her team to anyone looking to learn or improve their French language skills. "I struggled with French at High School and decided to revisit the language as an adult. I started classes in a fairly standard language school and even though I enjoyed their lessons, something was lacking. By coincidence I discovered Cosmopoli'French and I haven't looked back. The classes are fantastic and so enjoyable. It's an incredibly relaxed, supportive atmosphere and although my French needs lots of work I always feel able to practice speaking the language without feeling embarrassed. I would highly recommend Cosmopoli'French to anyone wanting to learn, or refresh their skills. The classes are varied, and focus on real life use of the language. Cosmopoli'French is the best!" I've been learning French on and off now for many years, but Cosmpoli'French was by far, my most memorable learning experience. Class sizes are kept small, and each lesson is so different and interesting, covering vocabulary you can actually see yourself having to use in France, or when speaking the language today. I use the term 'lesson' loosely as it felt more like going for a weekly chat with some of your french speaking friends - just with someone correcting you :-) It was a really relaxed and supportive environment, perfect for the borderline painfully shy student I was. I now live in France, but I still look at some of the worksheets I did back with Nathalie. 'How to write a formal letter in French', and 'How to converse with shop assistants' are both on high rotation at the moment! I would definitely recommend Cosmopoli'French to anyone looking to begin or improve their French. "I am very happy with the workshop approach to learning French, as I feel it makes learning much more interesting and informative. I especially enjoyed the 'slang' workshop as I was able to familiarise myself with more realistic conversational French rather than simply learning vocabulary from a textbook.I also found the food workshop, which was conducted in a French restaurant setting, delicious and a refreshing break from the classroom!" "Cosmopoli'French is everything that is good about learning a language. Nathalie makes the classes interesting and relevant with lots of enjoyable activities. Having a class whilst eating dinner at a French restaurant makes it much more like good fun than hard work. No more repeating irregular verbs over and over - instead we create dialogues, do role plays, watch French films, listen to music and learn about fashion and meeting French people! I now look forward to French each week and am very thankful for the experiences I have had in this class." 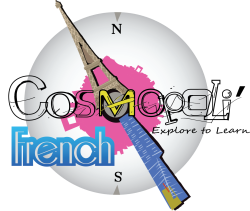 "Nathalie from Cosmopoli'French is certainly the best French teacher I have had over very many years of learning French. The course is thoughtfully designed, practical, flexible and responsive to specific individuals and groups. The environment is warm and friendly and there is a genuine enthusiasm in the teaching. Nathalie is a natural teacher - if you are looking to learn French I highly recommend her school." "Just a note to let you know how much I've enjoyed the workshops at Cosmopoli'French.Most of all I like the fact that we have to engage in the classes and use as much of the French that we have learnt as possible.The exercises have been challenging, but always rewarding. I also found Nathalie's kind and supportive approach very encouraging. Just what's needed when learning a language! I'm looking forward to next semester as much as I've looked forward to the workshops each week."